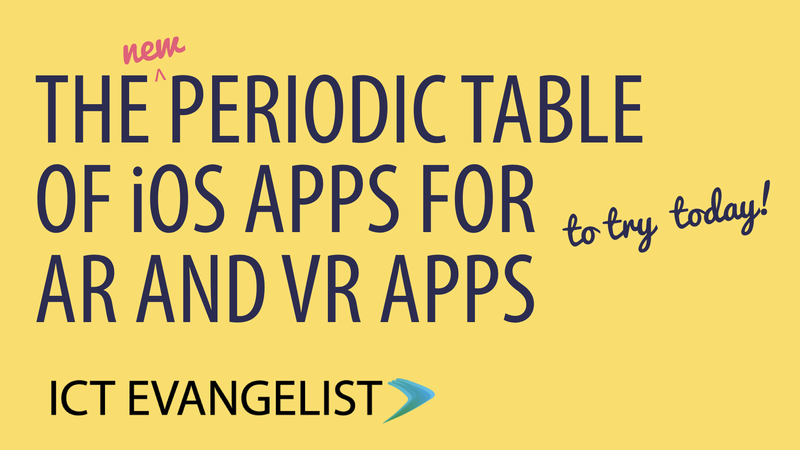 Last year I launched the first table of AR and VR apps at #BETT2018. 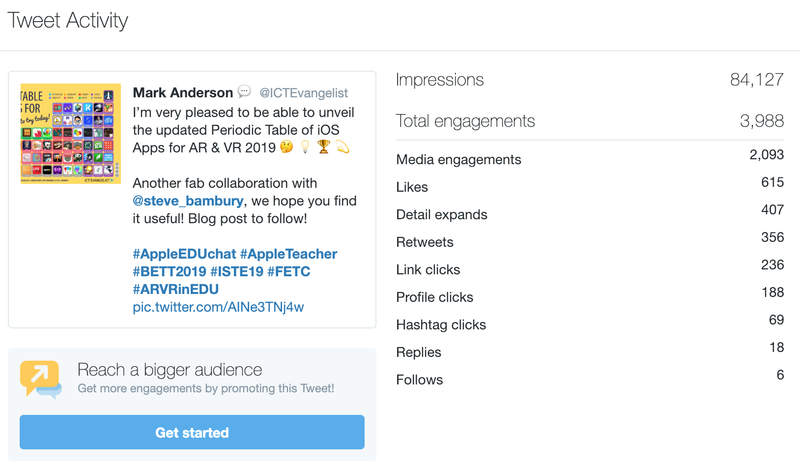 A collaboration with my good friend, colleague and fellow ADE, from the JESS School in Dubai, Steve Bambury; the table was hugely popular with educators the world over. So not long after it was launched, the journey to creating number two was commenced. 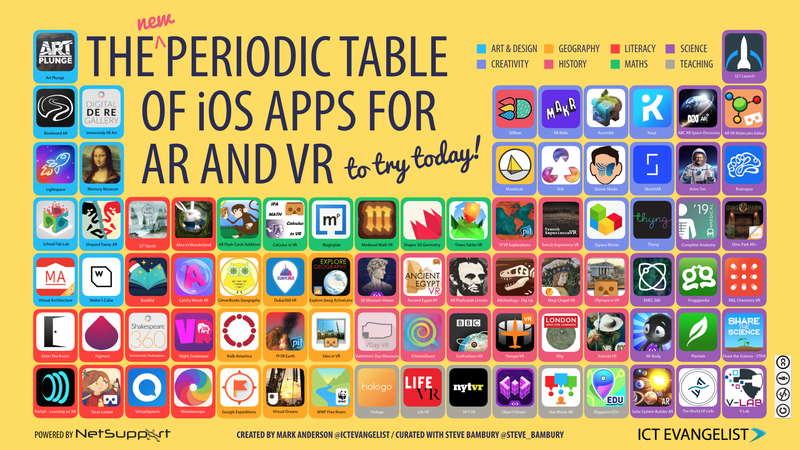 With my usual iOS App tables, I try to update the table rather than go for all new Apps because simply put, whilst innovation occurs, many of the same Apps are still just as relevant now as they were last year or the year before even. With AR and VR being such an innovative space, we decided rather than to make this one an update, like the others, this one should be more of a sequel. So, armed with that remit we began creating the new table. With 80 new Apps added to the table which weren’t available (or at least on our radar previously), we are very proud of what we have achieved. We launched the table at BETT again and as luck would have it, Steve was in the UK and so we were able to present it together and share the stage on the NetSupport stand. I tweeted the table out later that day and the response has been amazing! With standing room only and a hundred or so attendees spilling out across the walkway, the reception to the new table was phenomenal. And so without further ado, here it is! 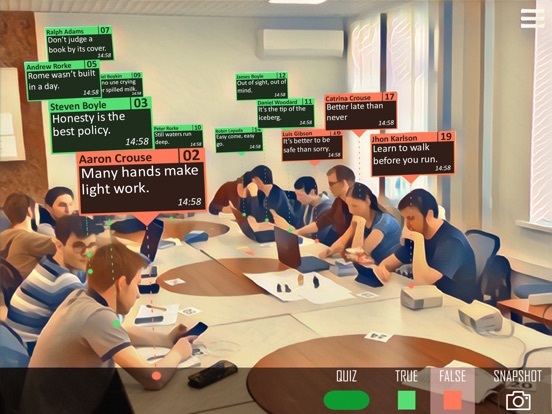 VirtualSpeech (4+) free – allows you to practice speeches, job interviews etc with feedback in VR based upon your performance. Great for literacy and oracy! Our Minds AR (4+) £2.99 – allows you to view learner feedback, respond to questions etc in AR, as shown in the example image below. I’ve seen this app available for free previously via AppsGoneFree app, so it is worthwhile keeping a lookout for it so you can save money. Civilisations AR (4+) free – a great AR App to explore artefacts shared in the BBC Civilisations series along with information about each artefact. My own son has used it even in his own class to explore a Mummy when learning about Egypt in class. Love it! As always the amount of work undertaken to complete these tables is pretty immense and so I would like to take this opportunity to thank Steve for all of his hard work on developing this resource. We hope you find it really useful and would love to hear how you might be using them in your school. If you’d like support or training around the use of any edtech, be it AR and VR in the classroom or any other, please get in touch via my contact form.